The bookies give each of these sides a similar chance of dethroning Surrey as county champions, on which basis you would expect this to be a close contest. Yet Somerset have beaten Nottinghamshire in each of their last six meetings in the Championship, often by handsome margins. What odds they extend the streak here? On the balance of the opening day, they may have their work cut out. Nottinghamshire fell short of the kind of first-innings score they would consider to be par on this ground, even in April, yet Somerset were relieved to be only three down overnight, having lost both openers in a terrific opening spell by Stuart Broad. It promises to be a good contest. Broad's availability for Nottinghamshire this year could extend deep into their Championship programme provided he stays fit, which gives him an opportunity to contribute in a more sustained way than circumstances have permitted so far in his 11 years at Trent Bridge, during which time five matches is the most for which he has been available in a single summer. At almost 33, he may be running out of ambitions, but to exceed his previous best tally of 19 wickets in a season might be one, and a fitting one in his testimonial year. He does not lack for either enthusiasm or effort, while both Azhar Ali and Marcus Trescothick, leg before and caught behind respectively as he charged in from the pavilion end, will testify that his skills remain venomously intact. After James Hildreth perished trying to steal a legside boundary off Luke Fletcher's first ball, leaving them 36 for three, Somerset were relieved to reach the close with no more damage done. All day it was an engaging battle between bat and ball. The boundary on the Fox Road side is short and the outfield quick, yet Somerset made the right choice in foregoing the toss and opting to bowl first. Indeed, they were rewarded in the second over of the match when Ben Duckett, with more than 400 runs to his name already, played back to a full delivery from Jack Brooks and was gone without scoring. The pitch had the colour of a sporting one and so it proved to be. Lewis Gregory, whose eight wickets were an important factor in Somerset's win over Kent at Taunton in the opening round, arrived with confidence high and bowled superbly, finishing with 6 for 68, his best figures since 2015. Nottinghamshire know him well - too well, they might say. Against no county has he taken more first-class wickets - 32 in 10 matches so far. Yet they were unable to deny him another good day in their company. He had a bit of luck - or perhaps not - when Chris Nash took an ill-advised liberty just before lunch, the batter pulling to Jack Leach at midwicket, but dispatched Joe Clarke, Steven Mullaney and Samit Patel with three terrific deliveries. Clarke, after the 112 and 97 not out that made for such an impressive Nottinghamshire debut last week, made only two this time before Gregory found some late movement and drew the nick, Steve Davies collecting the catch low to his right. Nash had been hitting freely, keen to profit from the quick outfield, and maybe Gregory sensed a cheap wicket. You sense that the former Sussex batsman, whose first season here was wrecked by a shoulder injury sustained in midsummer, will make his mark. More of a worry for Nottinghamshire is Patel. The former England batsman had a poor time of it in 2018, his worst season in statistical terms since 2012. He made two double centuries in June 2017 but does not have a first-class hundred since and has not really gone close. Gregory had a jaffa for him here, sending two stumps flying in opposite directions, for which you could hardly blame him. But the longer the wait for a score goes on the more you fear for his confidence. He was not the only frustrated figure among the home batsmen. Fifty partnerships for the second, fourth and sixth wickets failed to go any further, two of them broken by Gregory. Craig Overton denied Tom Moores an individual half-century as Trescothick just about clung on to a catch at second slip. The left-arm seamer Luke Wood, recalled from his loan at Northamptonshire after Paul Coughlin was ruled out with an injured finger, did complete his - an assured innings containing 11 fours - but would have been thwarted too had George Bartlett not put down a straightforward catch at midwicket. 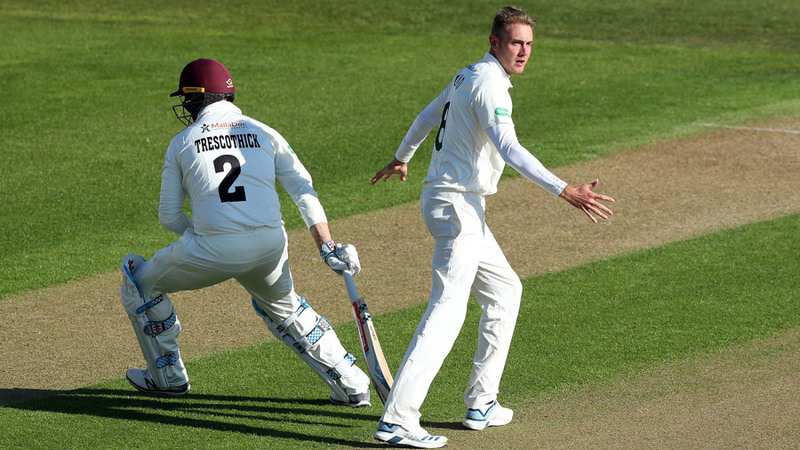 \"It's a weird pitch, really,\" Nottinghamshire's Nash said. \"It kind of goes to sleep for a bit and then there is a ball in it. \"Gregory bowled brilliantly, but I was annoyed with myself. We just needed to get through to lunch and if me and Samit had been able to build afterwards we could have been looking at 320. So I felt I let the lads down a bit there.\"